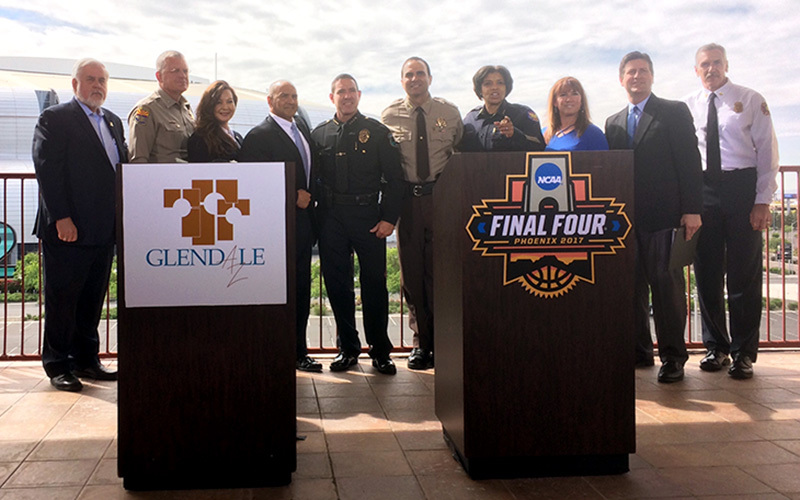 GLENDALE — The confidence Glendale and Phoenix officials have in security measures for the NCAA Men’s Basketball Final Four stems from success protecting other major events, including the College Football Playoff and two Super Bowls. Officials at a security briefing Monday said the four-day event is similar to the Super Bowl and its many days of festivities. “You never have too many people,” Glendale Police Chief Rick St. John said of the security force. The area around University of Phoenix Stadium will be on lockdown, he said, and everyone who enters and exits will be subjected to security screenings. This includes not only the stadium but vendors in the Westgate District next door. Because of traffic and incoming tourists, Weiers encourages the use of public transportation. Phoenix mayor Greg Stanton believes it can be a fun experience for residents as well as visitors. The weekend features free events put on by the NCAA. The security briefing included officials from Phoenix and Glendale, and representatives from the FBI and U.S. Department of Homeland Security. They spoke often about remaining vigilant and reporting things that look suspicious. St. John promoted the “if you see something, say something” policy but also reminded fans to enjoy the national event. If all goes as planned, fans won’t notice the security efforts.